With its central location, Delonix Hotel is within easy reach of most tourist attractions and business addresses in Karawang.The hotel features a wide range of modern facilities and services in its 115 well-appointed guestrooms and throughout the premises.All of the guestrooms are replete with air conditioning, bathrobes, daily newspaper, inhouse movies, desk, hair dryer, internet access.Guests can experience the high standards of comfort while staying at this luxury Karawang hotel with everything they need right on the site such as shops, elevator, bar/pub, laundry service/dry cleaning, meeting facilities, restaurant. In addition, the hotel's guests can enjoy the leisure and sports facilities provided on the premises: massage, jacuzzi, gym, sauna, steamroom, spa, garden.Being one of the good quality hotels in Karawang, guests staying at this hotel will find its convenient location and tranquil atmosphere pleasurable. To reserve a room at the Delonix Hotel, simply select your dates of stay and fill in our secure online booking form. Each of our popular 40 sqm Studio units is surprisingly expansive. They are havens of comfort and privacy. 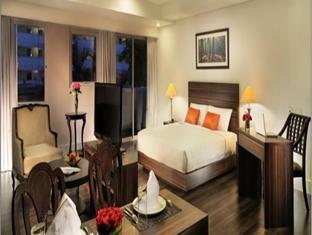 Our 60 sqm Deluxe Studios deliver generous space to stretch out. With a guest area and dining area, they offer excellent value and a homey feel. Thanks to details such as a comfortable sofa. Our expansive 70 sqm Two Bedroom units offer all the amenities of an established home, with separate areas for entertainment and dining and a spare bedroom with a sofa bed.